This mounting adhesive features a 1 mil clear polye ster carrier with .75 mils of solvent acrylic adhesive coated on both sides. The solvent acrylic adhesive offers a strong initial bond that increases over time. 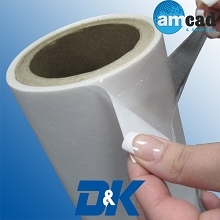 A mounting adhesive featuring a 1 mil clear polyester carrier with .75 mils of solvent rubber adhesive coated on both sides. The adhesive is protected by a 60# moisture stable liner. Standard solvent rubber mounting adhesives feature a high initial tack and are intended for indoor mounting applications. Optically clear permanent adhesives feature a clear polyester carrier coated on both sides with a permanent solvent acrylic adhesive. 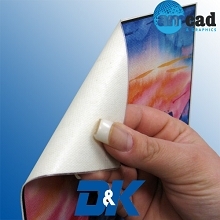 The adhesives include UV inhibitors to reduce color shift (fading) caused by sunlight and other UV sources. 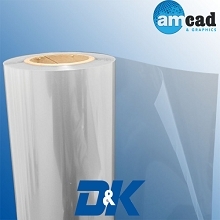 Two polyester film liners protect both sides of the adhesive and give the product a completely optically clear look. Optically clear permanent adhesives are ideal for permanent indoor or outdoor mounting applications to glass or acrylic. 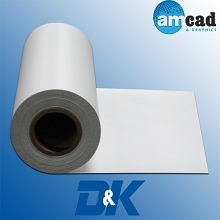 These adhesive products require a laminator with release liner takeup. A scuff resistant matte surface offers haze-free viewing that is ideal for high-end applications of all types. Available in 1 and 2 mil configurations. 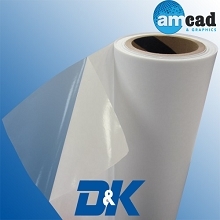 Optistick permanent is a unique optically clear mounting adhesive solution that features a clear polyester carrier film coated on one side with a low melt thermal adhesive and a permanent solvent acrylic pressure sensitive adhesive on the reverse. The permanent pressure sensitive adhesive is protected by a clear polyester release liner that is removed just prior to application. Graphic Wall Mount Adhesives feature revolutionary microsphere adhesive technology that allows graphics to be repositioned on walls up to 10 times. These microspheres will not leave behind any adhesive residue when graphics are removed up to one year after application.